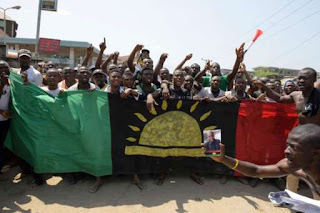 IPOB, Indigenous People of Biafra has declared May 30 a sit at home day. This, it said, would be to use the day to honour the Igbo who had lost their lives in sectarian killings in the country from 1945 to date. It enjoined the Igbo and all those who believe in the Biafra ideology all over the country to shut down their businesses and stay at home. In a press statement from the group's Spokesperson, Emma Powerful, in Awka, Anambra State, IPOB said prayers would be held at designated places to mark the day. Their statement read in part "The indigenous people of Biafra and its leadership worldwide would like to use this opportunity to inform Biafrans, friends of Biafra, lovers of freedom all over the world and humanity in general, to prepare for the historic annual Biafra Day of Remembrance 2017. "On the 30th of May 2017, as it is now the tradition since our leader Mazi Nnamdi Kanu held the inaugural event at our Cenotaph in Enugu on 30 May 2014, we shall honour the gallant and brave Biafran soldiers that withstood the might of the British-sponsored coalition against Biafra between 1967 and 1970. "Our heroes and heroines of the class of 1967-1970 who paid the ultimate price in defence of the dignity of the black race during this genocidal war against the people of Biafra, will be remembered and honoured in the finest traditions of IPOB. "This annual event for 2017 has been designated a day of prayer, fasting, supplication and introspection. The statement added "We shall also remember all the martyred freedom fighters (IPOB & MASSOB) that fell in pursuit of our liberation from the oppression and the tyranny of Nigerian Army, Police, Navy and DSS. 0 Response to "Biafra: IPOB Declares 30th May Sit-At-Home Day"